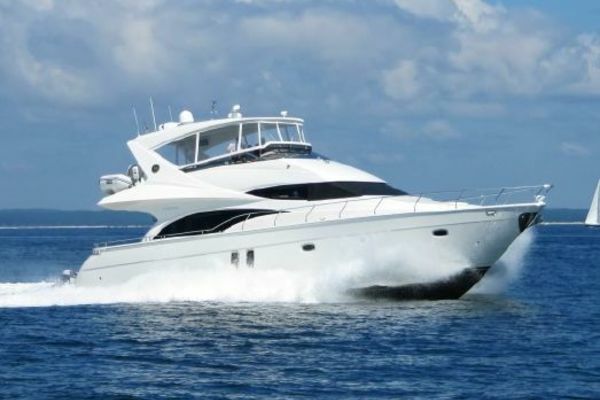 United Yacht Sales New Jersey would love to guide you through a personal showing of this 56' Horizon E56xo 2018. This yacht for sale is located in Unknown United States. For pricing details or a showing please contact us by filling out the form on this page and we will get back to you shortly! The new Horizon E56XO features sleek exterior styling, with reduced gunnel heights for a lower profile and large window lines, and her newly-designed outdoor areas focuses on the ultimate alfresco experience. A custom-designed aft deck transom cabinet transforms into a serving area, incorporating a BBQ, sink, storage, and baitwell -- a perfect spot to entertain or relax in while guests partake in water sports off of the hydraulic swim platform. For sunny days at anchor, the E56XO’s forward deck offers a dinette seating and sunpads, a popular design on Horizon’s larger motoryachts now included in this model. As the first Horizon E56XO is built for Australia, the main deck opens to a fully-equipped aft-galley and breakfast bar; extensive storage is located on the starboard side and includes a hydraulic Hi/Lo 50” TV that is ideally located for viewing either in the galley or the forward salon. With a Hi/Lo table and U-shaped seating, the salon can be easily transformed into a dining area that accommodates six guests. The forward lower helm features twin helm chairs, complete Raymarine navigational equipment, and everything needed to safely and easily pilot the E56XO sport yacht. Below deck, the full-beam Master stateroom is laid out to maximize space, with the head forward of the Queen bed, a chaise to starboard for taking in the view, and a large expanse of storage cabinets plus a closet to port. The VIP stateroom is found forward in the bow and replicated from the E56 model, but the starboard twin stateroom includes two twin beds; a sizable shared head is located to starboard. Powered by twin CAT C12A 715HP engines, the new Horizon E56XO is estimated to reach a top speed of 26 knots; with the optional Volvo IPS 950 engines, she will attain a top speed of 32 knots! Additionally, the hull has been designed to accommodate Seakeeper gyro stabilizers if desired, and the Yacht Controller wireless remote docking system included in hull one ensures stress-free maneuvering and docking.